We’d love your help. Let us know what’s wrong with this preview of History Of The Karmapas by Lama Kunsang. To ask other readers questions about History Of The Karmapas, please sign up. This book offers a very lively reading with plenty of amazing anecdotes and information about the marvelous everyday life of these great Tibetan masters. Well researched and beautifully written - full of magnificent photographs and watercolors -, it is profound and accessible at the same time. Anyone interested in Tibet and its form of Buddhism will want to include this book in their "must read" list. A book I would strongly recommend for the Buddhist and non-Buddhist alike. Of all the books I ha This book offers a very lively reading with plenty of amazing anecdotes and information about the marvelous everyday life of these great Tibetan masters. Well researched and beautifully written - full of magnificent photographs and watercolors -, it is profound and accessible at the same time. Anyone interested in Tibet and its form of Buddhism will want to include this book in their "must read" list. A book I would strongly recommend for the Buddhist and non-Buddhist alike. Of all the books I have read about the Karmapas this is the most inspiring one. I read half the book the first day and didn't want to put it down. The biographies and teachings went right to my heart; I could feel my heart opening as I read the words. Mila Khyentse Rinpoche's brilliant introduction is a real plus. Over the years, I have read plenty of books on reincarnation, but I still learned so much from Rinpoche's explanations. He elucidates from a totally new viewpoint, numerous concepts such as reincarnation, the principle of multiple emanations, the "tulku" system, the education and vision of reincarnated masters, etc. This is a lively tour through the seventeen emanations of the Karmapa, the head of the Kagyupa lineage of Tibetan Buddhism. I think it omits the confusion about who is the Seventeenth Karmapa and didn't mention the recent troubles with the Indian government and supposed misappropriation of funds. I recommend this book to anyone interested in Tibetan Buddhism and the process of reincarnation. 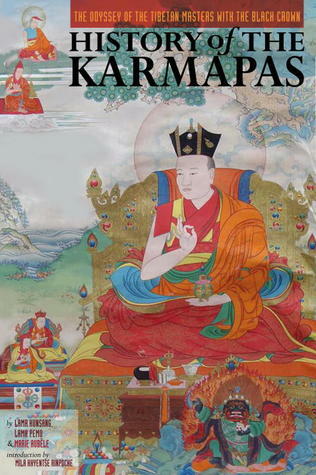 This is one of two books on the history of the Karmapas. This one is the most complete (more than double the size and includes the 17th). If you are at all inspired by any of the Karmapas, this lineage history is so inspiring for any practitioner or scholar. Inspiring, short biographies of the Karmapas. The book has a good introduction to Tibetan Buddhism. I think it could be at least 2 times as long! I often found myself wanting a more detailed account of many of the events.